While we’re definitely a fan of simple and quick meals, there’s always a time and a place for preparing things that are a little more complicated. 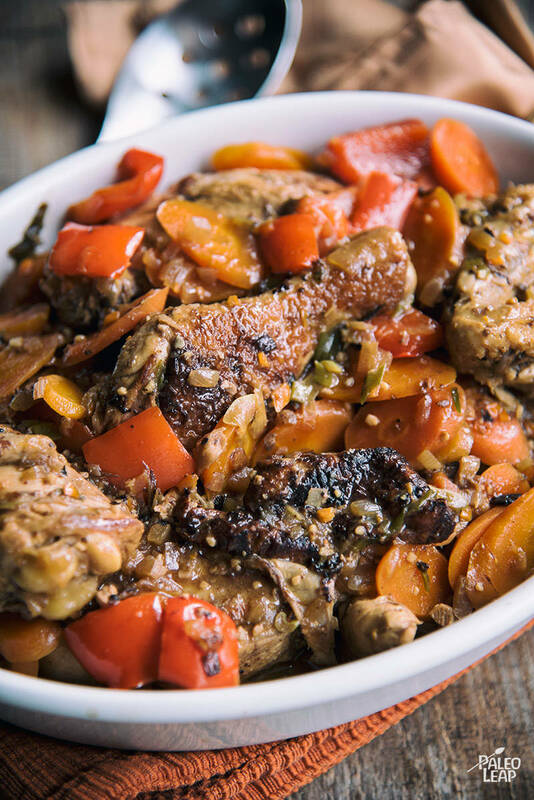 This is especially true when your meal is something as tasty as this Jamaican-inspired chicken stew – yes, there’s a lot of ingredients and time involved, but the result is a large, one-pot dish that’s perfect for making ahead of time and freezing for future meals. In this dish, you’ll be combining a chopped whole chicken with a variety of vegetables and spices that can be adjusted to your taste preferences. This is a great recipe for using up uncooked, leftover chicken – you can really toss in whatever you have on hand and this dish will still work! The key to making this recipe a success is the use of strong and spicy flavors, primarily from the hot pepper used and the dried thyme, paprika, and allspice. Although this recipe calls for a diced scotch bonnet, you can use any pepper (or peppers!) that you’d like. Just be mindful of how much heat you want in your meal – if you prefer something milder, omit this ingredient or use a mild pepper like the poblano; for more heat, try a habanero. While one of the benefits of this dish is that it doesn’t really need to be paired with anything to round out your meal, we can see how adding a salad might help a bit (especially if you need something to cool off your taste buds). A great option is this fresh summer salad – it’s light, flavor-neutral, and delicious. Place the chicken in a large marinating container. In a bowl, combine the green onions, red onion, garlic, ginger, scotch bonnet or hot pepper, fresh thyme, paprika, all spice, and coconut aminos; season with salt and pepper to taste. Pour the marinade over the chicken and stir until well combined. Marinate in the refrigerator 2 to 12 hours. Melt cooking fat in a Dutch oven over high heat. Brown the chicken pieces 4 to 5 minutes per side or until well-browned. Pour the remaining marinade over the chicken and lower heat to medium. Add the carrots and bell pepper to the Dutch oven; stir everything. Deglaze the pan with the chicken stock and bring to a light boil. Stir in the coconut milk, cover, and simmer 20 to 25 minutes.